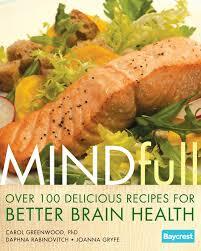 In the growing trend of healthy aging, MINDfull is an easy-to-read cookbook that will appeal to anyone who wants to optimize their brain health. Greenwood, who is a senior scientist at Baycrest Centre Foundation, has been studying the link between diet and dementia for years. As Greenwood describes it, the brain “has a wonderful capacity to refresh, to renew and to repair itself and to create new brain cells and new connections throughout a person’s life.” The goal of the book is to inspire healthy lifestyle and eating habits to promote successful aging and prevent the degeneration of one’s cognitive function. •	promotes the growth of new brain cells and neural connections. Each chapter of the book features practical nutrition information, tips and science-based references. With over 100 brain-boosting recipes like Sweet Potato Waffles, Indian-Spiced Chickpeas, and Malaysian Fish Cakes, you’re sure to find a few new favourites. It’s a welcome addition to my cookbook collection. Posted in Book Reviews, Healthy Eating | Tagged aging, Alzheimer's, book review, brain health, cookbook, dementia, healthy aging, recipes.